And this is why the soul will not start fulfilling the mission it was commanded to perform until it has completed thirteen years in this world. Because only from the twelfth year is the soul aroused to complete its task. Therefore it is written that “Abraham was seventy five years old”, since seven and five equals twelve. The Zohar employs a method of gematria known as mispar katan, “small” or “reduced value”, where the digits of a multi-digit number are themselves summed up to produce an “inner” number. In this case, 75 reduces to 12. The Zohar explains that it is only when a person turns 13 that their true soul begins to be aroused. Until that age, a child is dominated by the yetzer hara, the evil inclination. Indeed, it is the nature of a child to be selfish. This is expressed in its greatest form with a newborn, who is completely unconcerned about their parents’ wellbeing. As the child grows, they slowly learn to become less selfish and more selfless. By 13, they are (supposed to be) fully cognizant of this struggle, and now have the ability to truly overcome their yetzer hara. The Arizal elaborates on this through an exposition of the five levels of soul. While many think of a soul as being a single entity, it is in fact a collage of many sparks distributed among five major layers. The lowest level of the soul is nefesh, which is simply the life force. The nefesh is found not only in humans, but all living organisms. The Torah cautions (Deut. 12:23) that one should not consume blood with meat because hadam hu hanefesh, the blood is (or contains) the life force of the animal. 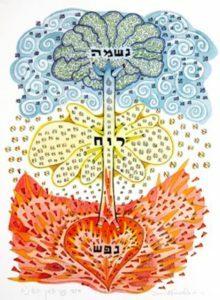 The layer above the nefesh is the ruach, an animating “spirit”, which the Sages state is housed within the heart, and encapsulates one’s inclinations, both good and bad. Then comes the most important soul, the neshamah, whose seat is in the brain. This generates the mind of a person, and makes up their identity and inner qualities. Beyond the neshamah is the chayah, the “aura” that emanates from a person’s body, and the highest level of soul is the yechidah, a spiritual umbilical cord of sorts that connects one to their source in Heaven. We can now understand why the Zohar above states that a person only begins to fulfil their task in this world starting at 13. It is at this age that they begin to tap into their neshamah, the most unique of the five souls, which contains one’s identity and purpose. We can understand why the Zohar says that before 13, one is dominated by the yetzer hara, for in this period one is still growing within their ruach, which contains the evil inclination. And based on this, we can understand the significance of a bar mitzvah. 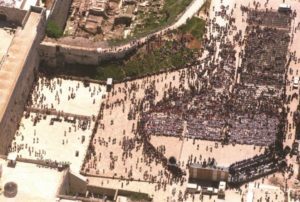 Jerusalem, 1999: A mass Bar Mitzvah celebration by the Western Wall for Soviet immigrants. The Mishnah tells us that a 13 year old becomes obligated in fulfilling the mitzvot. This is tied to the age of puberty (see Niddah 45b), and since girls begin this stage of life earlier, their age for mitzvot is 12. At this age, boys and girls are ready; their ruach now fully developed, and with it the ability to overcome tests and challenges. Their neshamah begins to emerge as well, meaning that they can start to find their unique niche in this world. By 20, it is hoped that a person has figured it out, and can now pursue it, as the above Mishnah states. Of course, many do not have it figured out by 20, and the Arizal maintains that some never tap into the full potential of their neshamah at all. This is particularly true in our generation. It is therefore of tremendous importance to guide and encourage bar mitzvahs and bat mitzvahs in their personal development, and to provide them with not only a physical education, but a spiritual one. It is imperative to remember that while these young people are not yet adults, they are no longer children either, and should not be treated as such. They should be challenged. They should be given responsibilities, and much more than just making their beds. Otherwise, they risk remaining in a state of immaturity and entitlement for the rest of their lives. The Midrash (Pirkei d’Rabbi Eliezer 26) states that it was precisely when Abraham turned 13 that he recognized God, rejected the immorality of his society, and began his life’s good work. Let’s inspire our youths to do the same. This entry was posted in Jewish Law & Life Cycle and tagged Abraham, Adam and Eve, Age, Arizal, Aura, Bar Mitzvah, Bat Mitzvah, Beresheet Rabbah, Charan, Children, Evil Inclination, Gematria, Heavenly Court, Kabbalah, Lech Lecha (Parasha), Midrash, Mishnah, Mispar Katan, Mitzvot, Nefesh, Neshamah, Niddah (Tractate), Pirkei Avot, Pirkei d'Rabbi Eliezer, Ruach, Sanhedrin (Tractate), Sha'ar HaGilgulim, Soul, Spirit, Talmud, Yetzer HaRa, Yetzer haTov, Youth, Zohar on October 23, 2017 by Efraim Palvanov. Devarim, or Deuteronomy in English, is the fifth and final book of the Torah. Deuteronomy comes from the Greek deuteronomion, meaning “second law”, which itself comes from the alternate Hebrew name of the book, Mishneh Torah, meaning “repetition of the law”. The name stems from the fact that Deuteronomy is essentially a summary of the four previous books of the Torah. The key difference is that it is given in the point of view of Moses, and records his final sermon to the people before his death. One of the enigmatic figures mentioned in this week’s parasha is Og, the king of the land of Bashan. 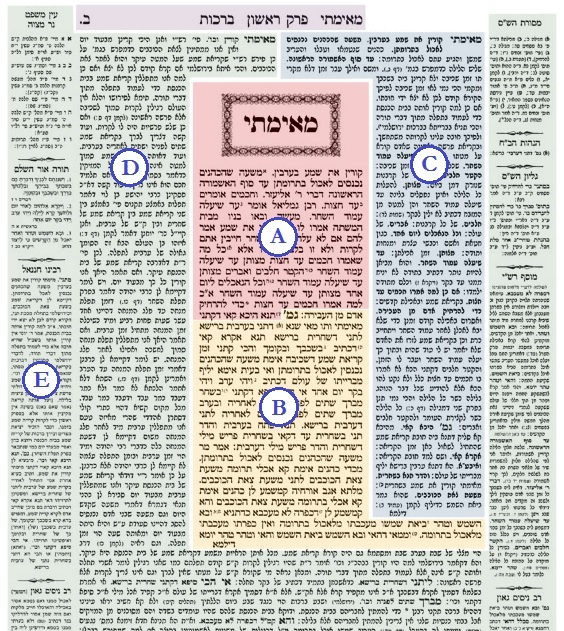 This character is explicitly mentioned a total of 10 times in the Torah, of which 8 are in this portion alone. He is first mentioned in the introductory verses of the parasha (1:4), which state how Moses began his discourse after smiting Sihon, the king of the Amorites, and Og, the king of Bashan. We are later told how Og had come out to confront the children of Israel, and the Israelites defeated his army in battle. Og is said to be the last survivor of the Rephaim (3:11), which were apparently a nation of giants. 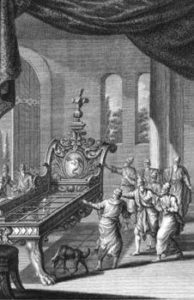 His bed is described as being made of iron, and being nine cubits long, or roughly 18 feet! Rashi provides a little more information. He tells us that Og was the last survivor of the Rephaim in the time of Abraham. It was then that the king Amraphel, together with his allies, dominated the Fertile Crescent region, and decimated many nations that inhabited it. One of these groups of victims were the Rephaim, and Og was the sole survivor among them. He was the “refugee” mentioned in Genesis 14:13 that came to Abraham to inform him of what had happened. So, who was Og? Where did he come from? Why did he initially help Abraham, but then come out to battle Moses centuries later? And was he really a giant? The Talmud (Niddah 61a) tells us that Og was the grandson of Shemhazai. As we have written previously, Shemhazai was one of the two rebellious angels that had descended to Earth. These two angels argued before God that He should not have created man, who was so faulty and pathetic. God told the angels that had they been on Earth, and given the same challenges that man faced, they would be even worse. The angels wanted to be tested anyway, and were thus brought down into Earthly bodies. Of course, just as God had said, they quickly fell into sin. This is what is meant by Genesis 6:2, which describes divine beings mating with human women. Their offspring, initially called Nephilim, were large and powerful, and were seen as “giants” by common people. However, during the Great Flood of Noah, all of these semi-angelic beings perished. Except for one. 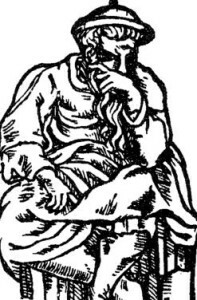 Midrashic texts famously record that Og was the only survivor of the Great Flood, aside from Noah and his family. When the torrential rains began, Og jumped onto the Ark and held on tightly (Zevachim 113b). He swore to Noah that he would be his family’s eternal servant if Noah would allow him into the Ark (Yalkut Shimoni, Noach 55). 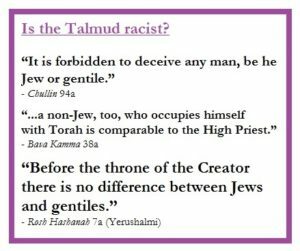 The Talmud (ibid.) states that the rain waters of the Flood were actually boiling hot. Yet, the rain that fell upon Og while he held unto the Ark was miraculously cool, allowing him to survive. Perhaps Noah saw that Og had some sort of merit (after all, his grandfather was the one angel that repented). Noah therefore had mercy on Og, and made a special niche for Og in the Ark. This is how the giant survived the Flood. 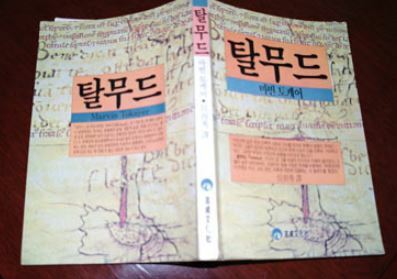 A variant account suggests that Og survived by fleeing to Israel, since the Holy Land was the only place on Earth which was not flooded. As promised, Og became the servant of Noah and his descendants. The Zohar (III, 184a) says that he served Abraham as well, and as part of his household, was also circumcised. As Rashi says (on Genesis 14:13), Og informed Abraham that his nephew Lot was kidnapped, and that the armies of Amraphel and his allies were terrorizing the region. Rashi quotes the Midrash in telling us that Og hoped Abraham would go into battle and perish, so that Og would be able to marry the beautiful Sarah. For informing Abraham, Og was blessed with wealth and longevity, but for his impure intentions, he was destined to die at the hands of Abraham’s descendents (Beresheet Rabbah 42:12). Whatever the case, the giant soon fell into immorality. The Zohar continues that although he had initially taken the Covenant upon himself (by way of the circumcision), he had later broken that very same Covenant by his licentious behaviour. He used his physical abilities to become king over 60 large, fortified cities (Deuteronomy 3:4). When the nation of Israel passed by his territory, he gathered his armies to attack them. It is important to remember once more the old adage that one who believes that the Midrash is false is a heretic, yet one who believes that the Midrash is literally true is a fool. It is highly unlikely that Og was actually so immense (especially considering that this would make him bigger than the dimensions of Noah’s Ark). The Torah tells us his bed was nine cubits long, which the most conservative opinions estimate to be closer to 13 feet, a far more reasonable number. There are many more colourful stories about Og, including one where a Talmudic sage found his thigh bone and ran through it (Niddah 24b). Another suggests that Og is actually Eliezer, Abraham’s trusty servant (Yalkut Shimoni, Chayei Sarah 109). This is an intriguing possibility, and might help explain how Abraham and Eliezer alone were able to defeat the conglomeration of four massive armies (See Genesis 14, with Rashi). Perhaps this hubris was Og’s fatal flaw, and brought about his ultimate downfall. 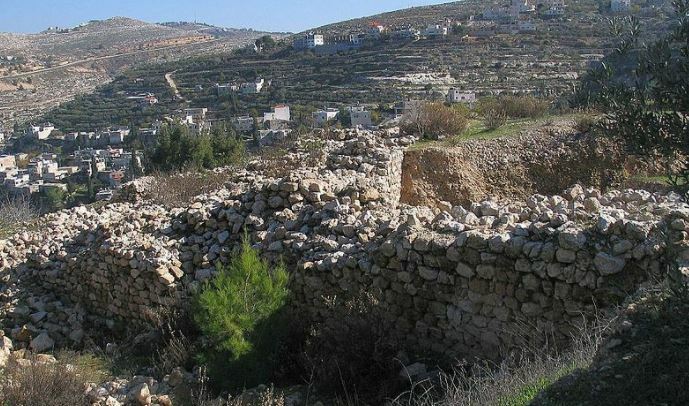 Interestingly, there are also a number of dolmen found in the modern-day area that would have been Bashan. 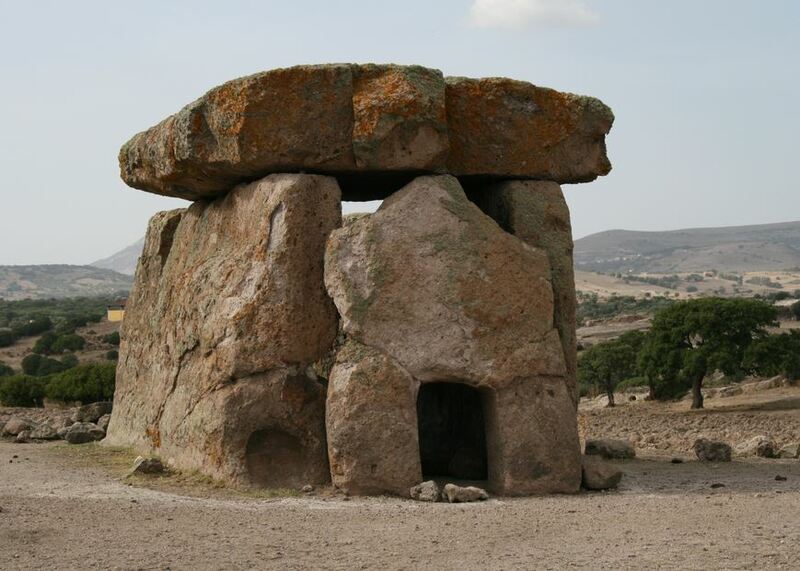 These dolmen are massive stone structures that were erected millennia ago, with some rocks weighing many tons and perplexing scholars as to how they were put together. It is thought that dolmen served as burial tombs, and perhaps have a connection to the tradition of giants living in the Bashan area. 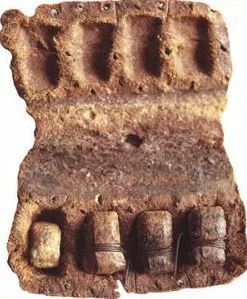 This entry was posted in Archaeology & History, Midrash, Mysteries & Origins and tagged Abraham, Amorites, Amraphel, Angels, Archaeology, Bashan, Brit, Circumcision, Covenant, Deuteronomy, Devarim, Dolmen, Eliezer, Flood, Genesis, Giants, Greek, Midrash, Moses, Nephilim, Noah, Noah's Ark, Og, Phoenicians, Rephaim, Sarah, Shemhazai, Sihon, Talmud, Zohar on July 20, 2015 by Efraim Palvanov. This week we start a new book of the Torah, Shemot, known in English as ‘Exodus’. This volume is primarily concerned with the period of Israelite slavery in Egypt, and the subsequent salvation following the ten plagues and the Splitting of the Sea, climaxing with the revelation at Mt. Sinai, and the start of the transmission of the bulk of the Torah’s laws. Coincidentally, not long ago was released Ridley Scott’s new film, Exodus: Gods and Kings, and I finally had a chance to see it this week. Though it appeared to show a little bit of promise at the start, the movie soon unravelled into a bizarre re-invention of the Biblical story. Of course, there is nothing wrong with some artistic liberties when adapting an ancient text for a modern film, nor is it too much of a problem to fill in some of the gaps in the Torah’s narrative. However, Exodus: Gods and Kings presented a completely twisted version that did not even slightly stick to the basic story of the Torah. It would take an entire tome to cover all the mistakes in the film, but perhaps we can offer just a few of the most blatant ones. 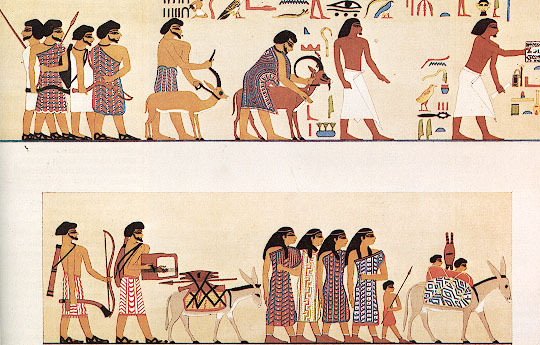 The Semites have a different skin tone, different hair styles, clothes, and so on. The filmmakers clearly knew this, as they show Moses bearded and sporting a nice hairdo, while all the other Egyptian royals are clean-shaven and bald. His eyes look different, and he wears clothes of a completely different style than all the others. How come? Didn’t he ever question why he doesn’t look anything like his “royal brethren”? More importantly, the Torah clearly says that Moses was initially raised by his true birth mother, Yocheved (Exodus 2:7-9). Only after he was fully weaned did Yocheved present Moses to his new step-mother, the Pharaoh’s daughter (v. 10). It is totally inconceivable that Moses did not know he was a Hebrew! The Torah states that when Moses grew up, he “went out to his brothers and looked at their burdens” (2:11). He knew full-well that he was going out to his people. At this point, when he saw an Egyptian taskmaster violently beating a Jew, he stepped in to save the victim, killing the Egyptian in the process. In the movie, this heroic act is replaced with an enraged Moses killing an Egyptian guard who was doing nothing terrible at all. The kind, compassionate Moses, described by the Torah as the humblest man that ever lived, is turned into a violent brute who kills indiscriminately. No wonder that Christian Bale, the actor who plays Moses, said of his character that he was “likely schizophrenic and was one of the most barbaric individuals that I ever read about in my life.” Makes sense if all he ever read about Moses was in the script for the film. If Christian Bale did indeed read about Moses, perhaps he missed the whole part where Moses selflessly led his people for forty years in the wilderness. Where he literally sat from morning to evening to counsel the people and help them (Exodus 18:13). Or when he refused to abandon his people, even when God offered to make an entirely new nation out of Moses (Exodus 32:10). The many occasions where he convinced God to avert His just decrees and forgive the nation for their sins. The time where his sister Miriam transgressed severely against Moses, yet he did not hold even the tiniest of grudges or ill-will, and immediately prayed to God to heal Miriam and have mercy on her (Numbers 12:13). 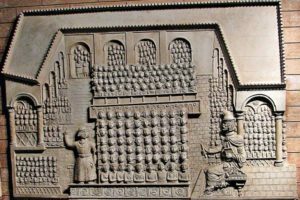 Or the simple fact that Moses led the revolution that brought monotheism (together with a higher sense of morality, starting with a set of Ten Commandments) to over two-thirds of the world’s population. When one studies the texts and commentaries, it becomes clear that each of the Plagues was specifically tailored towards the sins of the Egyptians, and was designed to bring the rightful justice that was due. Nowhere is this fact even hinted to in the movie. Most telling was after the plague of the firstborn, when Pharaoh confronts Moses demanding an answer as to why they suffered such a tragedy. The latter gives no logical reply, saying only that no Hebrews died. Perhaps the scriptwriter should have had something along the lines of: “Hey Pharaoh, did you forget all the countless babies that you slaughtered? Or the many warnings you were given that this was coming, and to stop your evil ways?” The scene almost makes Pharaoh seem like the victim, and Moses the villain. It appears that the main aim of the movie was to cast Moses (and God) in a bad light. It really seems like the filmmakers went out of their way to do this. Moses is shown carelessly abandoning his family when he goes back to Egypt to save his people. His wife and son are angry, emotionally-scarred, losing their faith – and Moses does nothing about it. What was the point of making this shift from the Torah’s original version, which clearly states “Moses took his wife and sons, mounted them upon the donkey, and returned to the land of Egypt…” (Exodus 4:20)? He never abandoned his family, but took everyone with him! It therefore appears quite evident that the purpose of Exodus: Gods and Kings was to turn one of the most beautiful and enduring stories into an ugly, twisted, and corrupt tale. The sheer number of mistakes is both inexcusable and inexplicable. One who wishes to experience a far truer (and more entertaining) version need only to open and read this week’s Torah portion. This entry was posted in Holidays and tagged Egypt, Film, Hollywood, Miriam, Moses, Mt. Sinai, Nile, Pharaoh, Semites, Shemot, Splitting of the Sea, Talmud, Ten Commandments, Ten Plagues, Yocheved on January 9, 2015 by Efraim Palvanov.